Deepen your practice. Expand your knowledge. Become a certified yoga instructor. We are proud to offer an extensive and renown yoga teacher training program. Expect to learn all the skills essential to successfully teaching yoga to others: postures, anatomy, sequencing, and adjustments. Delve into the origins, philosophy, schools, and gurus of yoga’s long history and profound, contemplative roots. Yoga Teacher Training is an opportunity for an immersive yoga experience, learning and refining the crucial tools for sharing yoga with others while deepening each trainees personal practice and knowledge of the yoga tradition. All programs are registered with Yoga Alliance and graduates are eligible to register as RYTs (Registered Yoga Teachers) upon completion. Read reviews of our program here. Yoga practice is the most ancient and powerful personal transformative tradition in the world, and that heritage is currently in our hands. Yoga instructors have the knowledge and skills to bring the healing and contemplative potential of yoga to others. It is inherently powerful work. Evan and Kelly Harris have studied yoga traditions since 2002. Registered with Yoga Alliance at the E-RYT 500 level, their studies have taken them to nationally and internationally recognized instructors over the last 15 years. This includes five months of study in India as well as ongoing intensive study with their current teacher, Matthew Sweeney, since 2009. In 2008, they brought Ashtanga yoga to the QCA. 10 Weekends. 10 Trainees. One Life-Changing Experience. Are you ready? Our Quad Cities yoga teacher training program offers an opportunity for remarkable growth and change while learning the essential skills for sharing yoga with others. Facilities: Three studio spaces, conference room with A/V equipment, kitchenette, ample parking, local restaurants, and public park within walking distance. Limited to 10 trainees and aimed at both teaching skills and personal growth, this course is an immersive yoga experience. This program is not specific to Ashtanga Vinyasa yoga, but a general yoga training touching on many traditions and styles. 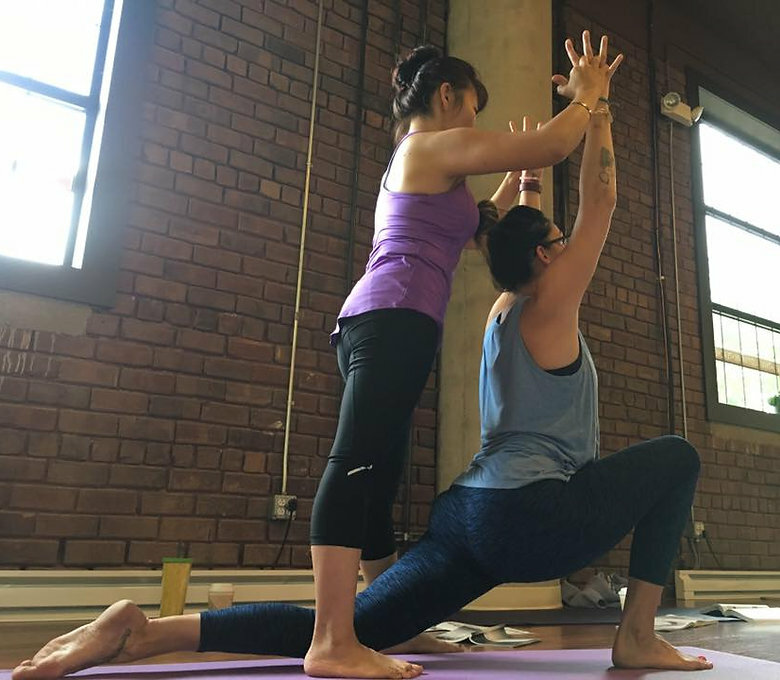 Trainers: Evan and Kelly Harris have studied yoga traditions since 2002. Registered with Yoga Alliance at the highest level (E-RYT 500) they have studied and taught locally, regionally, and internationally and trained nearly 100 teachers since 2010. This is a 200-hr Yoga Alliance registered yoga teacher training program in the Quad Cities. Check out our profile and read reviews here. All graduates are qualified to register as Registered Yoga Teachers, which continues to be the industry standard. Full program cost is $3000, or $15/hr of training (200 hrs). This includes all training hours, activities, and books. Graduates will be fully equipped to teach a yoga public yoga class at nearly any facility and will have all the materials necessary to register with Yoga Alliance. We are proud to offer payment plans and a 15% discount for all trainees paid in full by the early-bird deadline (8/1). Ready for the next level? Welcome to graduate school for yoga teachers. Advanced Yoga Teacher Training at tapas is a registered 300-hour Yoga Teacher Training program with Yoga Alliance, and graduates will be eligible to register at the RYT-500 hour level. Check out our profile and read reviews here. The curriculum offers more depth, subtlety, skill, and elegance in all the elements of quality yoga instruction and yoga practice: anatomy, adjustments, sequencing, meditation, demonstration, introspection, presence, alignment, and more. Additionally, a main thrust of this training is each trainee finding and developing her own voice as a yoga instructor. With patience, guidance, and inspiration, each instructor can harness her unique combination of traits and evolve them into something greater. The Advanced curriculum involves extensive time for practice, composition, instruction, feedback, refinement, and more. It also draws on small group work and community projects to teach content as well as integrating the very process of learning and development itself. Applicants must have completed an 200-hour Yoga Teacher Training program at tapas or elsewhere. Tuition is $3750 for all materials, hours, and activities. Returning tapas 200 hour training graduates receive $100 off tuition. We are proud to offer payment plans and two early-bird discounts. Pay in full by 7/1 and receive a 15% discount. Pay in full by 8/15 and receive 10% off. Contact us to learn more or apply. Join us for an informational session on this training on Sunday, June 10th at 5p.